Black Power Air Fryer XL Oven Elite is a 6-quart capacity, 10-in-1, state-of-the-art “As Seen On TV” air fryer with a very modern design, that includes a Rotisserie Plus and a Professional Dehydrator. You’ll also get a large accessory kit of some twenty pieces. 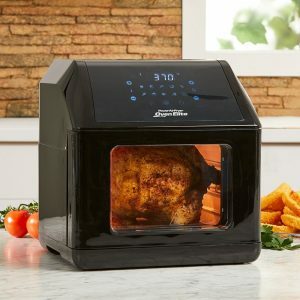 This new Power Air Fryer Oven Elite is the upgraded and better-built version of the previous “Power Air Fryer XL” and “Power Air Fryer” ovens that were mostly plastic. The Elite XL has a smart digital LED display panel with auto shut-off, and the interior retains heat better and is easier to clean up. With the ten one-touch pre-set programs with the symbols you see on the panel you can cook different ingredients and meals without having to worry about setting the right time and temperature. It has a very clear large transparent window that lets you see what’s going on inside without needing to open the side door. The window is also detachable and you can clean it easily. You have an efficient motor with the 1500 watts of Turbo-Cyclonic Power that delivers very hot cyclonic air 360 degrees at up to 400 degrees Fahrenheit with the Rapid Air Technology. You’ll get your ingredients air fried- crispy on the outside and juicy on the inside without the extra oils, fats or calories of deep fried. Both the top and the bottom and all the other parts of your food will be cooked evenly. You can also use it as a great rotisserie and dehydrator. You can actually cook many batches at once thanks to the three crisper trays included in the box. This model does not give off a plastic smell like the older Power Air Fryers. It weighs 21.6 pounds and measures 16.7 x 15.8 x 15 inches and will take up a bit of space on your counter. But considering how multifunctional this 10-in-1 unit is, it will replace a few cooking items in your kitchen saving you on space. 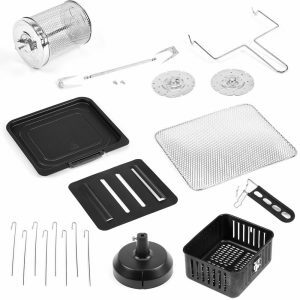 There is a stainless steel interior rack, a frying basket with handle, a stainless steel rotating round basket with a fetch tool, three crisper trays, a rotisserie stand, a rotisserie skewer set and a drip tray that catches the oil and helps prevent mess and makes cleaning easier. You’ll get three recipe books by Eric Theiss in the box: Rotisserie Mastery Cooking Guide, America’s Number 1 Favorite Fried Food Recipes Revealed and Dehydration Creations. You can make beef kebabs, roast chicken or pork, air fry drumsticks and potatoes. And you can dehydrate herbs, fruits, veggies and have great healthy dried snacks without the added chemicals, preservatives or sweeteners of the store-bought dried snacks. It is a very good quality, functional, reliable and durable cooker that is built to last a long time. I ordered this lovely oven and really like it…I live in Canada……Ontario. I told my friend about it and how to order but when she went to order one today, they said you do not deliver to Canada anymore….I just got mine last week. ?? We only review the products. Please contact the seller on Amazon.com product page about this matter. They ship to a lot of countries in Europe etc. So I would assume Canada should be OK too. Thank you. I ordered this oven from QVC and it works well however, it is quite loud. Is anyone else finding this to be true or perhaps something is wrong with mine. Even in the next room, with the TV on it is still a loud droning sound.